A Chilli Mandragora that has produced a mushroom from spores. 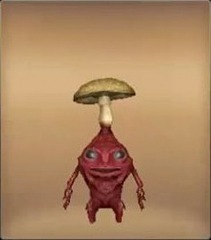 If it grows near yellow ores or minerals, the mushroom will usually turn out yellow in colour. According to Lestanian folklore, such mushrooms have magickal properties.